I recline, lounging on a leather-clad bench across the whole rear of a saloon car. The long, sleek, deep burgundy parabolic curves are chrome-railed, a décolletage of Gatsby-esque elegance gliding effortless over the ebon tarmac. Cool leather and mahogany adorn the near-silent ride as, single leg crossed and loafer tapping, I sit lamenting the rise of the middle class and erosion of standards. I vibrate with the feral rumble of eight All-American cast-aluminum cylinders growling as I streak inches away from yellow stripes shrunk to dots, one hand resting on the steering wheel, two fingers tapping along to the George Thorogood pumping out the radio, the other hand curled on the shift knob. Quick stomps to the metal pedal and pulls to the stick unleash a throaty roar, pressing me back into the seat as the car tears down the highway. Fighting heavy lids, I peel my back loose from a vinyl seat in a hail-dented Subaru, battling greenhouse torpor for hours made endless by the lack of air-conditioning. My high-revving steed shudders its way above 65 miles an hour begrudgingly, whining against any lead-footed entreaty for speed. My co-pilot dozes, made languorous by the heat streaming rainbow through the prism of a cracked windshield and a lack of gas stations boasting any beverage beyond the 87-octane slurped down like ramen by the engine. My mind wanders, “How is it still 95 degrees at 8 p.m.?” “Can anything live out here?” Then I am tugged back by the twin esses built by some well-meaning civil engineer trying to keep drivers like me safely aboard his asphalt twin-track. This is a road trip. Not some smooth carriage ride around a park, not a visit to grandma’s, or some temperate tour around the town. This is an overambitious, over-filled agenda powered by caffeine and gasoline. A sore-backed staggering out of cramped quarters stagnant with the cooped-up perfume of two very warm grown men. This is a chance to test one’s mettle, and to see new places, dare new things, and eat way too many wasabi peas. We started driving in the pre-dawn dark, but I began in earnest the night before, packing and cleaning until my things all fit, tetris-style in the rear of the car and there were only a couple hours left for me to sleep. We fled west, a flight futile before the speed of dawn, but crested mountains as the sherbet sunrise broke in the east. My co-pilot drowsed fitfully alongside as I enjoyed soft-lit western vista, dropping swiftly down into the Bighorn Basin. The early start and uncertainty of distance gave me pause, promoting some reflection into the vastness of territory we had traversed only two hours into the journey. Though small and tight-grouped, the Bighorn Mountains are an imposing sight, and daunted hardy pioneers with their timbered slopes. A crossing that once took a week, I finished in less than a morning. Reflector poles whipping by grabbed hold and connected themselves to the news of Usain Bolt’s retirement, still fresh in my mind. My co-pilot shook me out of my reverie. “Hadn’t realized I was thinking out loud,” I say. We pass the next hour and change in a comfortable silence, me immersed in my thoughts, he striving to quiet his and return to the arms of Morpheus. Long drives bring out the best and worst in people, and few things sour friendships or expose new facets of someone’s character like being trapped in the same space with them for hours at a time. That sort of containment is a litmus test of someone’s social character as well, as not everyone can handle silence, either in their own head or in the space around them. Throw in discomfort of some stripe, and the true colors come out even quicker. After an hour listening to the hum of rubber on pavement, I knew I had made a good choice in my companion. We began to talk about plans for the trip, and branched into a number of other subjects, reaching a point where both of us lapsed into a comfortable silence again, having exhausted what we had to say. Road trips are a unique experience of the self, a test of discernment regarding companionship, and a nostalgic test of personal endurance. Few other activities allow for deep musings into the twilight of the soul and the elaboration on the findings from such introspection, while simultaneously requiring a focused attention on the task at hand. 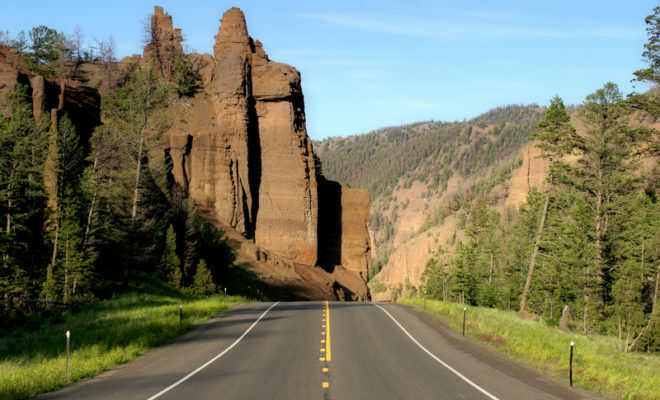 As we joined the throngs of tourists leaving the western gate of Yellowstone Park and left the twists and turns of Wyoming behind, I had another moment of realization: that I couldn’t wait for the drive back.